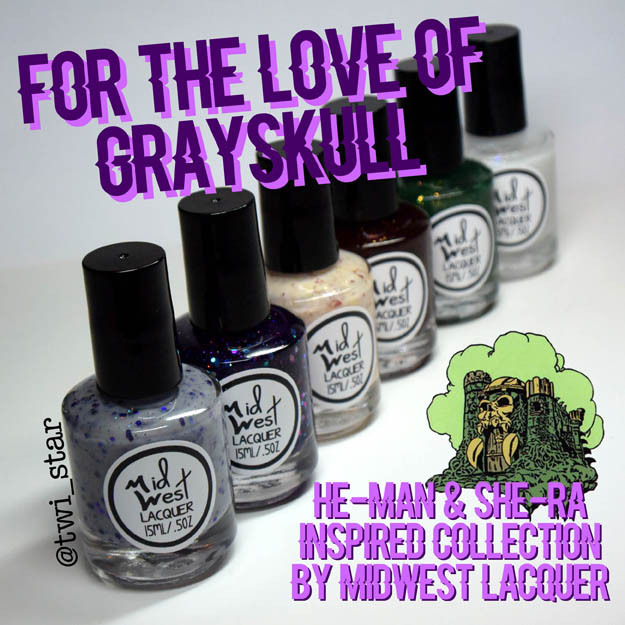 twi-star | Nail Art Blog: MidWest Lacquer For The Love of Grayskull He-Man inspired collection! 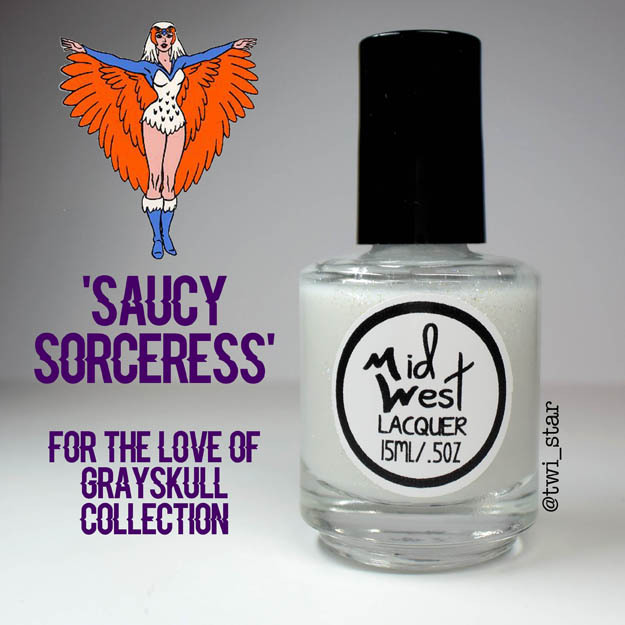 First up is ‘Saucy Sorceress,’ inspired by the winged Sorceress. 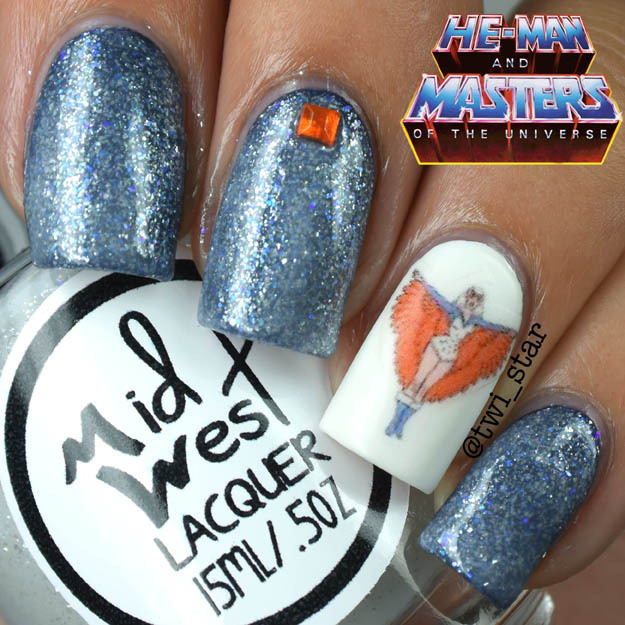 This is a sheer white jelly with white and blue flakies, and blue and purple iridescent glitter. You can build it for opacity but I used it as a topper over black, show here at 2 coats. 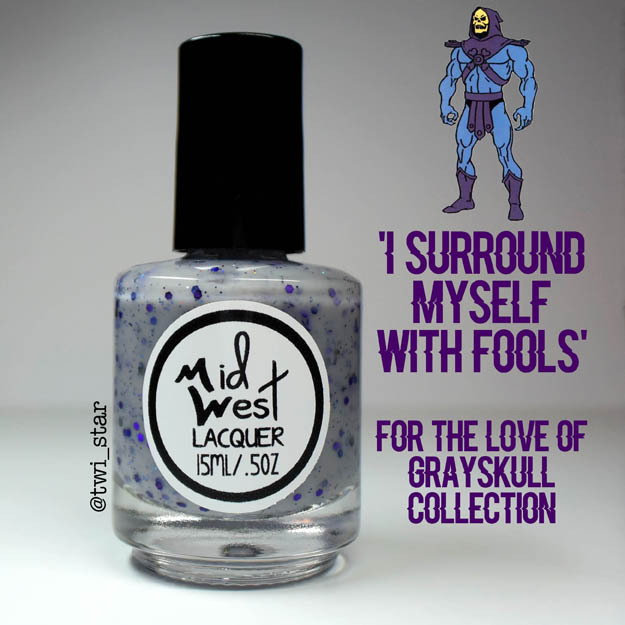 Next is ‘I surround Myself With Fools,’ inspired by the baddie Skeletor. A light gray crelly with purple, sapphire, and black glitters. Loveeeeee this one! I think this is 3 thin coats, the glitter dispersed evenly. I think the vivid purple glitter really pops off of the gray base. 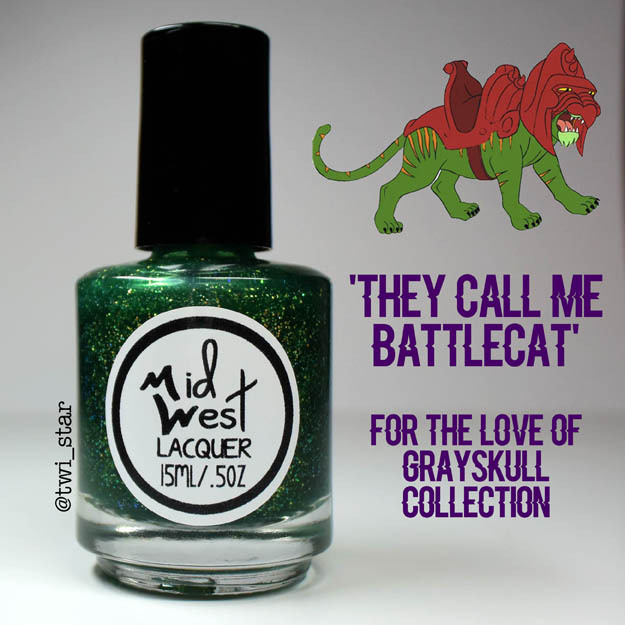 Next is ‘They Call Me Battlecat,’ inspired by the beast that He-Man rides, Battlecat. 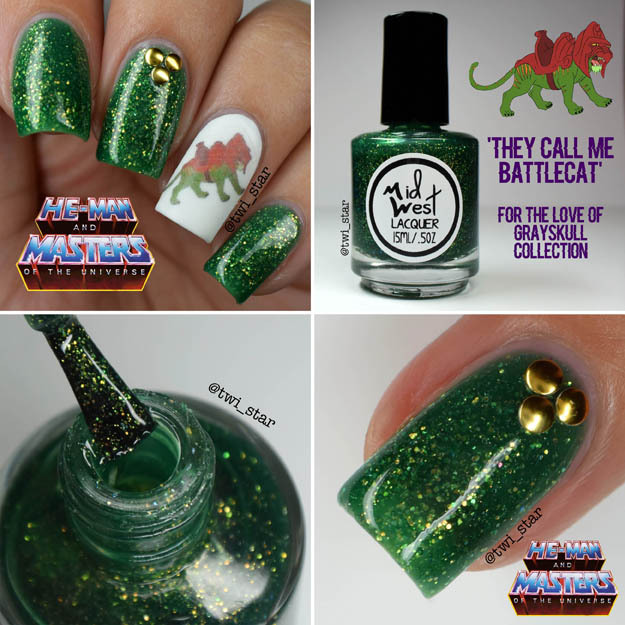 It’s a green jelly with lime and gold flecks, and orange and green iridescent glitters. I can’t help but think of St. Patty’s day with this one! This is 3 thin coats. 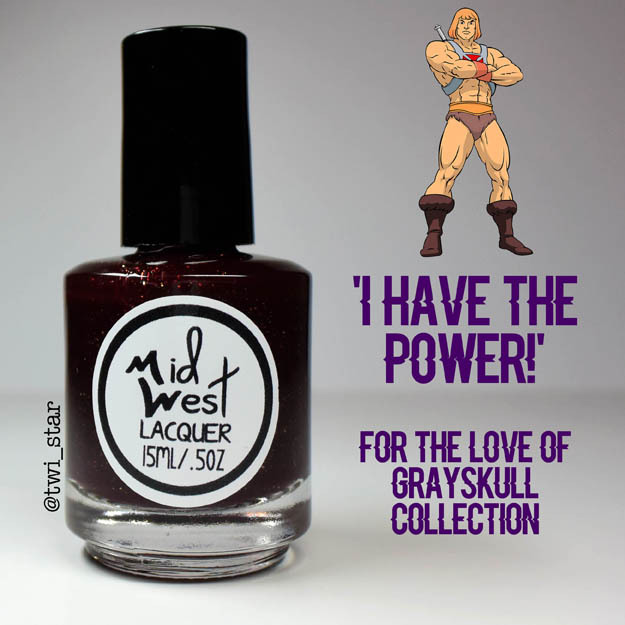 Next is ‘I Have The Power,’ inspired by none other than He-Man. This is a dark berry jelly with gold flakes . This will be so perfect for Fall! I’d love to pair it with a shimmery gold. This is 3 thin coats. 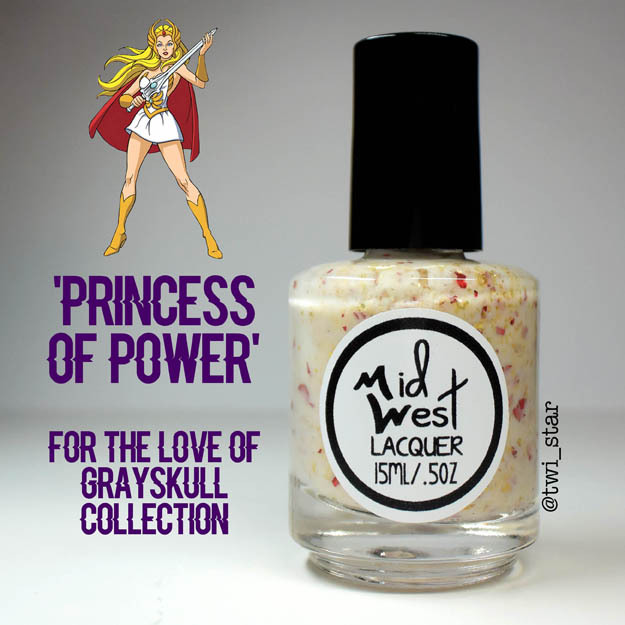 Next is ‘Princess of Power’ inspired by She-Ra and her outfit. The colors match her perfectly. It’s a white crelly with red and gold flakies. 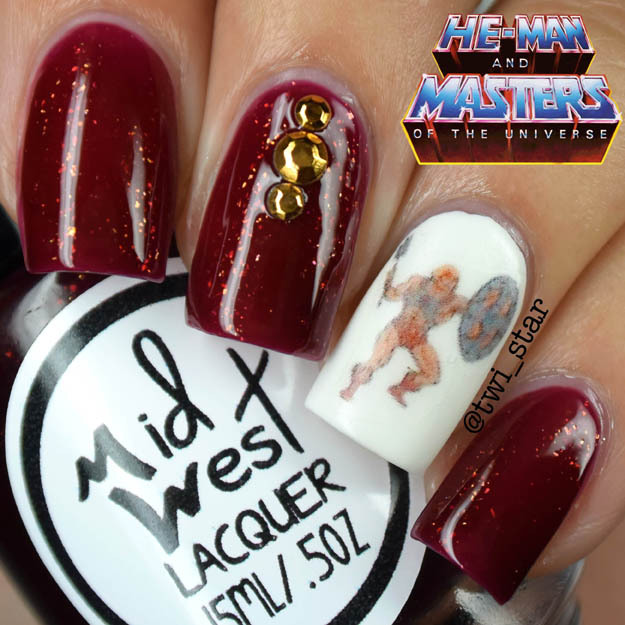 So pretty and would look great paired with the above He-Man polish! This is 2 coats. 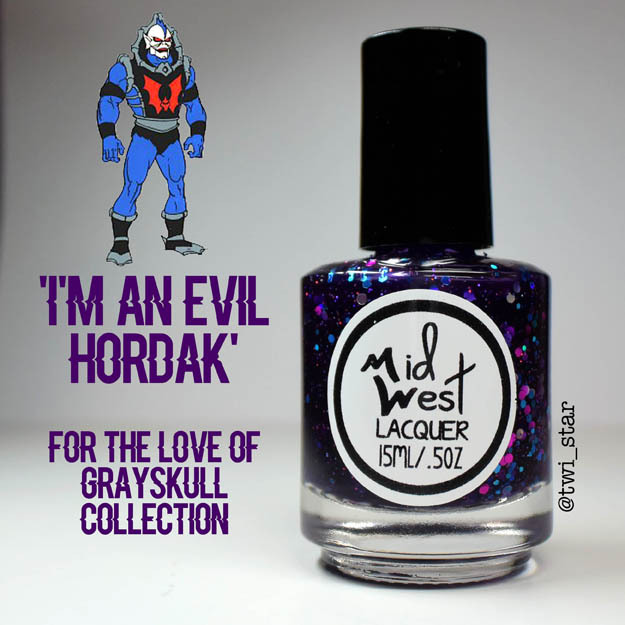 And last is ‘I’m an Evil Hordak,’ inspired by Hordak another baddie. 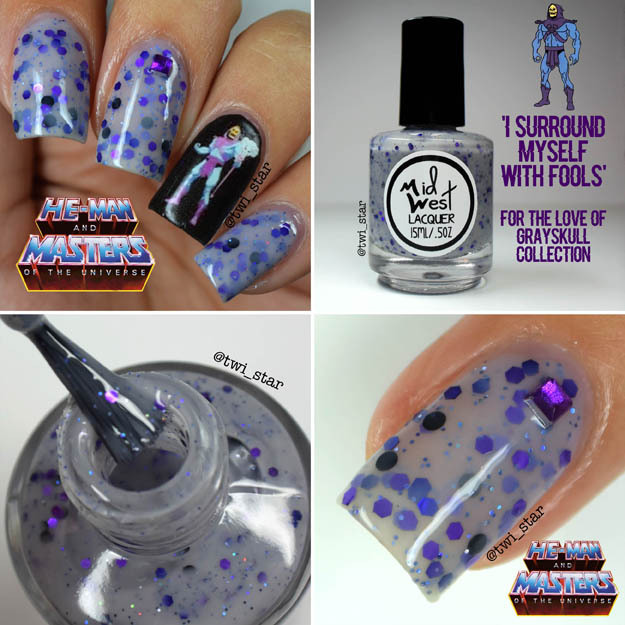 It’s a purple jelly with pink and purple holo glitter, and teal, silver, and fuchsia circle glitter. This one has so much depth! I think this could be my fav of the collection…. Although ‘I Surround Myself With Fools’ is sooooo close! 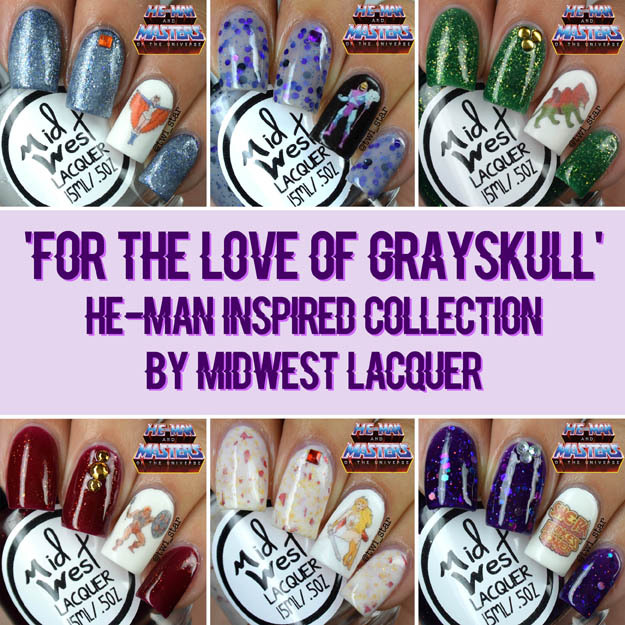 The ‘For The Love of Grayskull’ collection release on Friday, July 27th at 7:00 pm est on Vinyl It Up! I definitely remember watching this cartoon back in the day. I wasn't the biggest fan, but these polishes are so gorgeous! OHMYGOD. I had the entire She-Ra set. Even the castle...oh nostalgia. 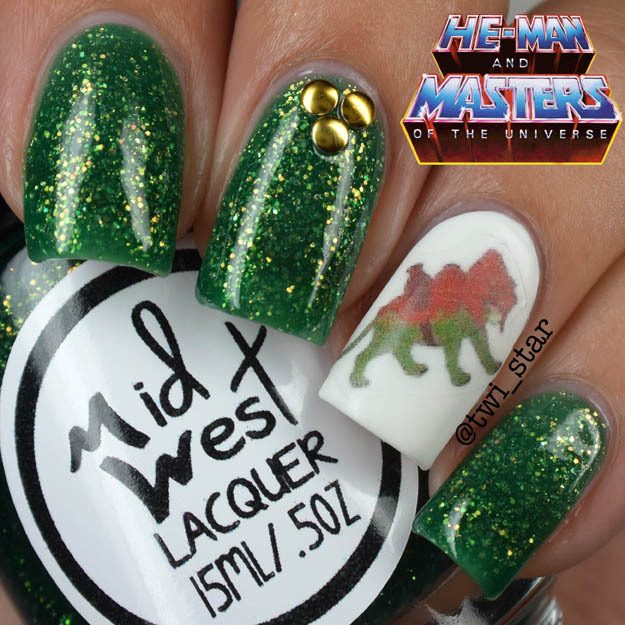 Wow these are super cool and i looove the decals! Every one of these are perfect for the character they're named for! I feel like I need them all. 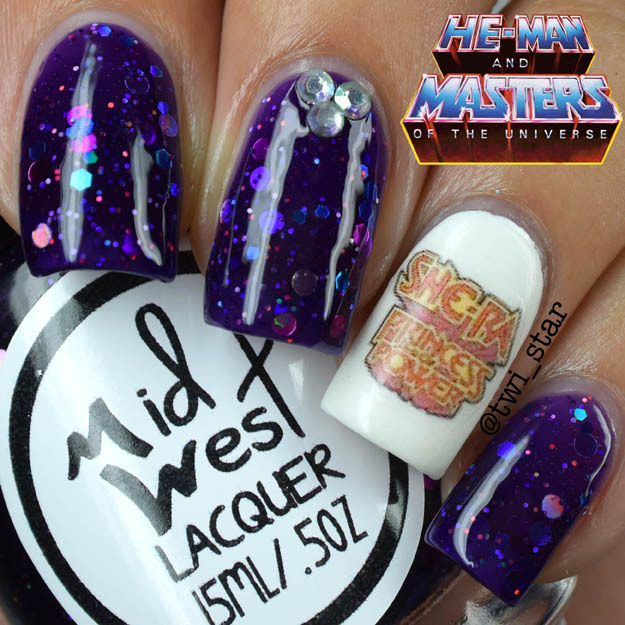 I used to love She-Ra! 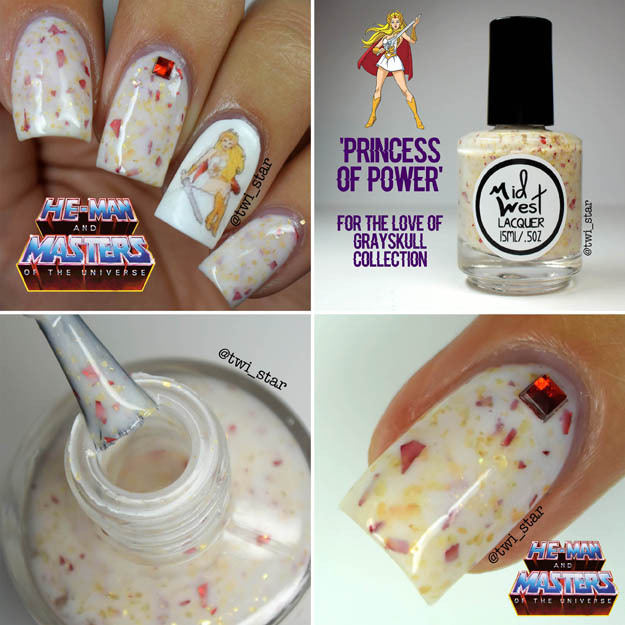 I just love Princess of Power! I LOVE this collection! All of them are awesome, I'm gonna need them! What a fun collection! 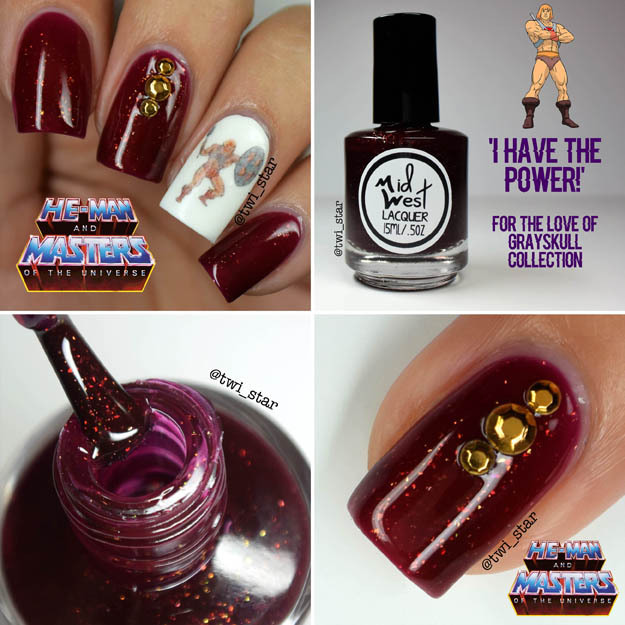 I'm actually really drawn towards Princess of Power which is surprising given that it's definitely not a colour I normally am attracted towards. 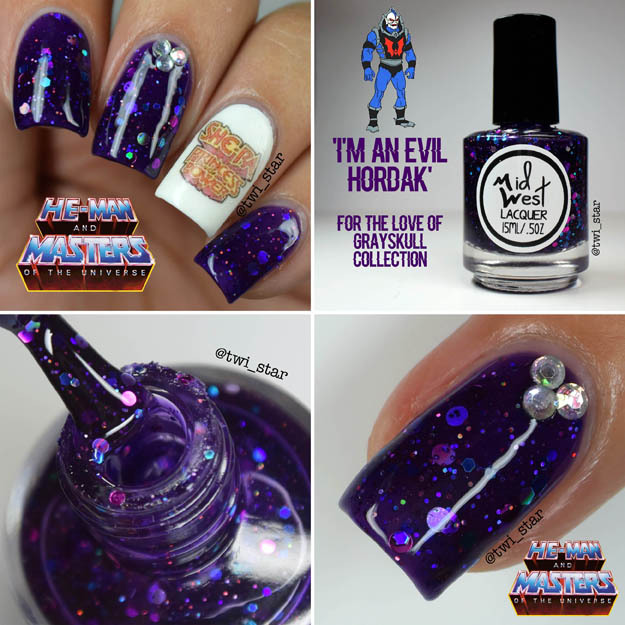 Oooooo I'm an Evil Hordak is gorgeous! Kinda looks like Emily de Molly's Cosmic Forces. I have it and despise the formula though. It's horrible. Might have to get this one and get rid of the EdM. This is such a trip down memory lane. I loved that cartoon and had a bunch of the toys. The polishes capture them perfectly. Wow! You made your own decals?! Holy cow! I loooove the vampiness of "I Have the Power" and the shred in "Princess Power." 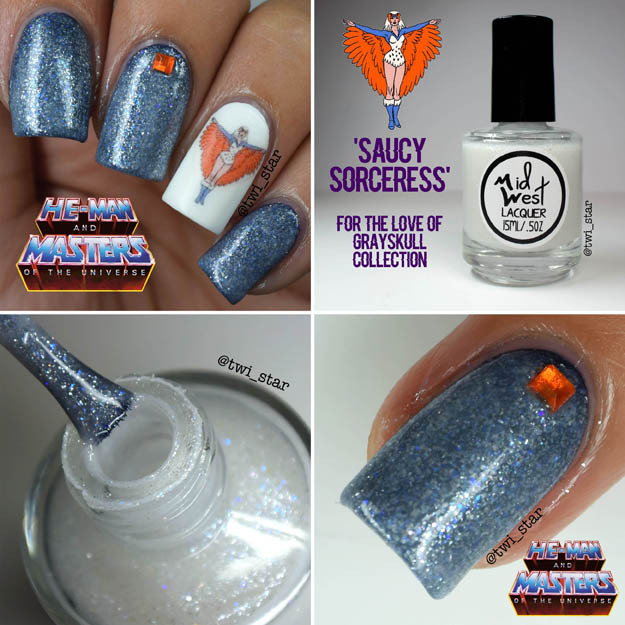 Omg this is such an amazing collection!!! 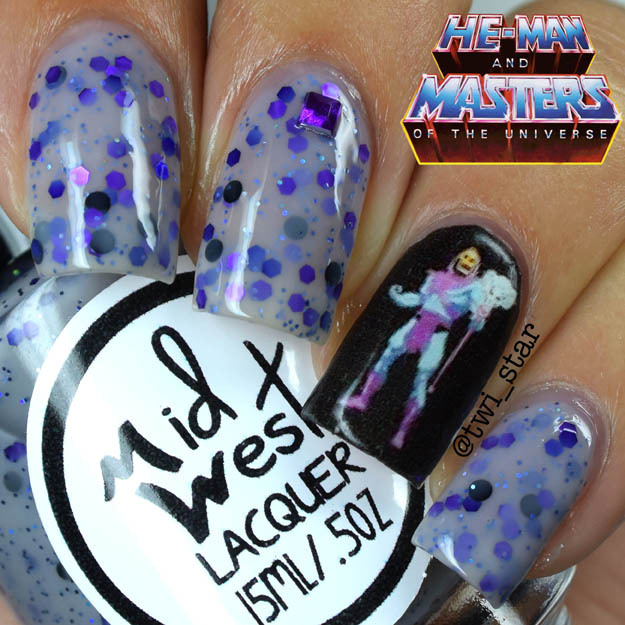 The 80s was before my time, but the Hordak one is very pretty. So awesome! I was She-Ra several times for Halloween when I was little! Skeletor man. He's always been my favorite!